Don’t you love acronyms? They are useful if you know what they mean and if you are communicating with others who know the same ones. They exist across the range of human subjects and are specific to their own topics. If you don’t know what an acronym stands for then they are as useful as if someone spoke to you in a foreign language. EOM is commonly used in emails in the local government organisation where I worked for the last four years. And in that time I never knew what it meant. It’s significance seemed unimportant, so I was never prompted to ask. On my last day I received a phone call from a local newspaper reporter asking me questions about why I was leaving. I told him that it was because I was going to care for my father who is failing quickly with Mesothelioma. I reminded him that he needed to go through the usual Council communication channels. Prompted by his enquiry I wrote a media release and sent it through to the Council media person. It had not occurred to me that this would be of any interest to the local community. 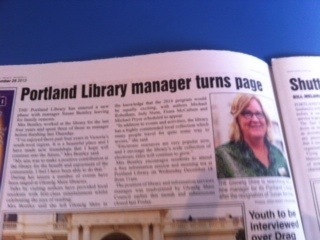 It was published in the newspaper under the cute heading “Portland Library Manager turns the page“. This entry was posted in Uncategorized and tagged acronyms, EOM, life, news, publicity, work by suesbent. Bookmark the permalink.